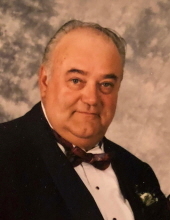 Age 75 of Owosso passed away Tuesday, October 9, 2018 at his home. Funeral services will be held 2pm Sunday, October 14, 2018 at Nelson-House Funeral Homes, Owosso Chapel. The family will receive friends at the funeral home on Sunday from 12pm until the time of service. Bill was born November 25, 1942 in Morrice, the son of Alexander and Thelma (Monroe) Gilbert. He married Flossie (Fitzpatrick) in Morrice on June 23, 1967. Although Bill graduated from Durand High School, he attended Morrice schools for the majority of his formative years. Bill was a member of the Seventh Day Adventist Church for more than 45 years and proudly served in the United States Navy. Bill enjoyed tinkering / working on cars, hunting and shooting his guns in his younger years. He traveled some with his family. He was a masterful “story teller” and enjoyed telling tales with his friends and customers at his shop. Bill was owner and operator of Bill's Repair and Sharpening. This was a mainstay small business in Shiawassee County between Owosso and Morrice for decades. He is survived by his wife of 51 years Flossie; children William Alexander (Priscilla) Gilbert, Danel Roberta (Lance) Monroe, Daniel Martin (Renee) Gilbert, and Cecil Bowers; 18 grandchildren; 16 great-grandchildren; other loving family and friends. He was preceded in death by his mother and father, his brothers Robert, Alex and Wesley, his sister Phyllis and his daughter Dana Bowers. Bill was a proud veteran of the United States Navy and saw active service during the Vietnam era on the Aircraft Carrier USS Princeton. Memorial contributions are suggested to the Wounded Warrior Project. To send flowers or a remembrance gift to the family of William Robert Gilbert, please visit our Tribute Store. "Email Address" would like to share the life celebration of William Robert Gilbert. Click on the "link" to go to share a favorite memory or leave a condolence message for the family.